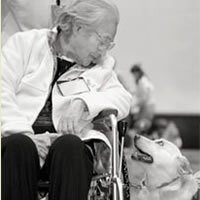 With their strong loyalty and deep affection toward humans, therapy dogs assist in the treatment of elderly people, disabled or sick people in improving their mental or physical functions. 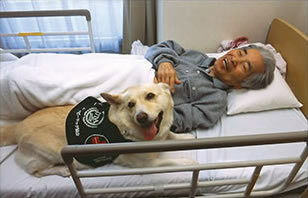 With the participation of therapy dogs in the treatments, patients have been known to recover their lost memories, and regain movement of their hands or feet. At ITDA, we work to bring out the individual ability and nature of each dog, and provide care that matches the need and condition of each patient. 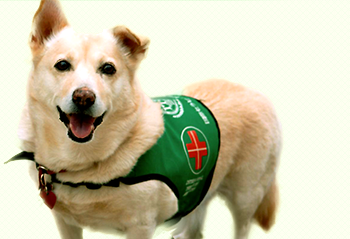 Therapy dogs visit and provide services at nursing homes, hospitals (including cancer wards), mentally disabled people’s facilities, nurseries/kindergartens, schools (elementary, junior and senior high schools etc. 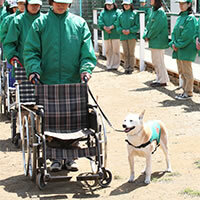 ), prisons (rehabilitation program for inmates), and areas affected by disasters all over Japan. 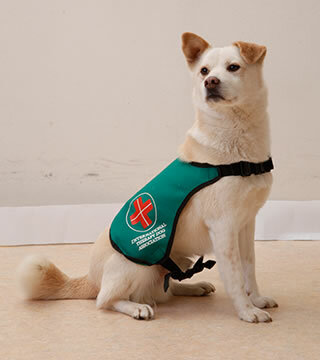 At ITDA, we rescue stray dogs and dogs that had lost their owners and had no place to go after the 2011 earthquake/tsunami, and train them to become therapy dogs. After recovering health both mentally and physically, these dogs spend over 2 years of training to master a training curriculum consisting of more than 45 steps. 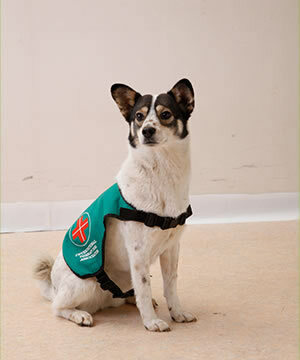 Once they receive sufficient on the job training at various facilities, they will be certified as therapy dogs. 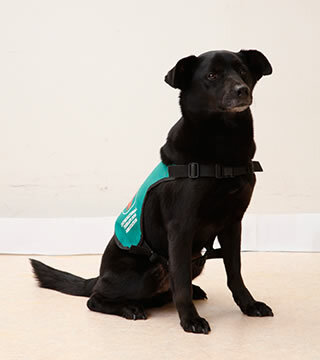 There are dogs of various breed and age, even ones that have overcome physical disabilities, which are still active in the field as therapy dogs. Eye contact is when a person (handler and/or patient) and a dog look at each other. This is to coordinate each other’s feelings and wishes, and is important in establishing trust between the two. A dog will judge a person’s situation through this eye contact. This movement is the basis for all other training. The dog will maintain just enough distance from a person’s leg on the left side and walk at the same speed as the person. 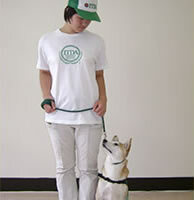 During the training, the speed or the direction may be changed, or the person may use a cane so that the dog will be able react immediately to any changes in the person’s movement and walk alongside the person. “Types of walking speed” Regular, fast walking, running, slow walk, cane walk, cross walk ( when there are obstacles), walking alongside a wheelchair etc. This is when multiple dogs are trained together to walk at the same speed. 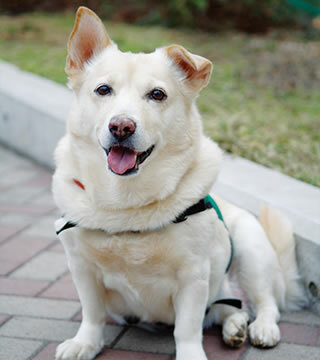 The purpose of this training is for the dogs (especially for disowned dogs or dogs with little external contact growing up in closed environment) to regain their sociability. This is mainly to learn to walk at same speed alongside an elderly person. You walk slightly slower than normal to imitate the pace of a person walking with a cane and make the dog understand this pace. Some dogs may feel threatened by the cane from past experiences of being beaten by sticks when they were strays. You will have to work together with the dogs to help them overcome this fear. 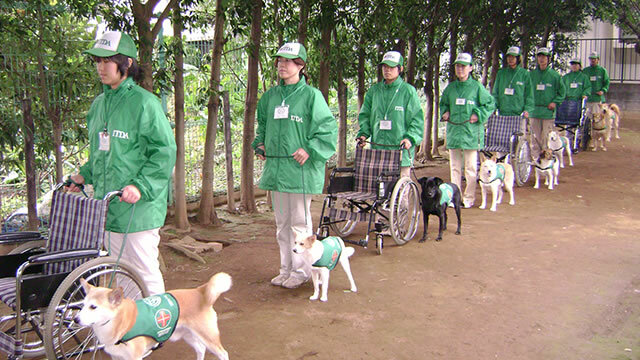 There is a variation of cane walk training where a dog is trained to walk at the same speed alongside a person with injuries from accidents or suffering from aftereffects of diseases. The dogs are not only trained to react to the changes in the pace but also to the person’s irregular movements. 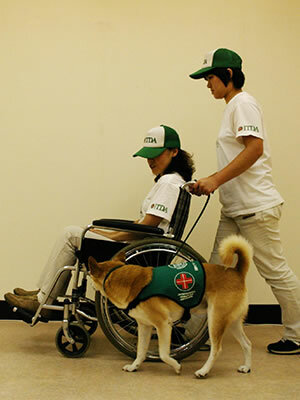 This is to train the dog to walk at the same speed alongside a person on a wheelchair. 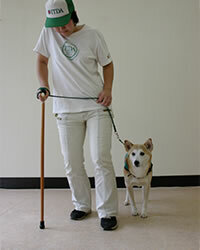 With normal heel walk, the dog will be walking a little distance away on the left side of the person. But in case of a wheelchair, the dog will be walking just next to the wheelchair on the left side. 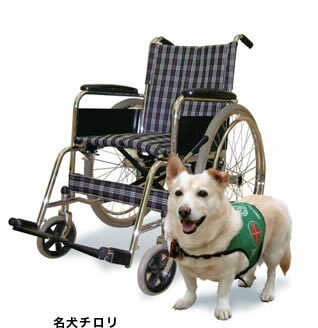 The dog is trained to listen to the sound of the brakes on the wheelchair being unlocked, and when the signal is given, the dog will start walking alongside the wheelchair. At this time, you must be careful so that the wheel will not run over the dog’s foot. 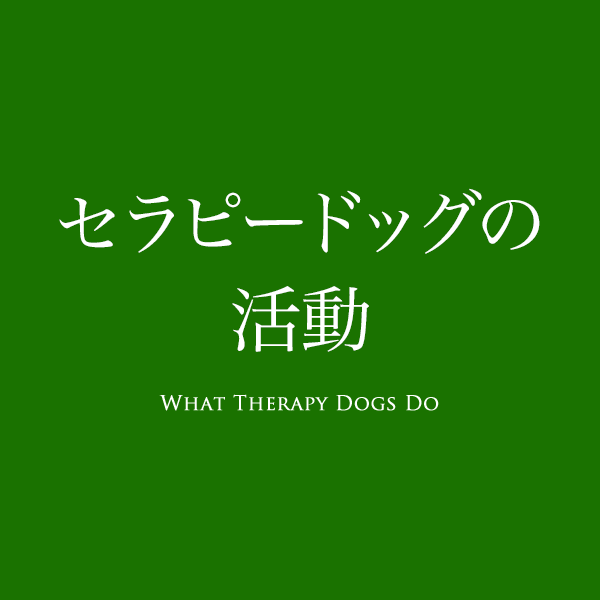 This is to train the dog for providing therapy to patients in private rooms at hospitals and nursing homes who cannot move or get up from bed. The dog is trained from how to enter the room, approach the bed, get off the bed until leaving the room. 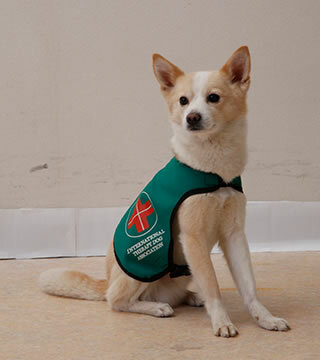 Together with the therapy dogs which have been trained for the purpose of providing animal assisted therapy, handlers visit hospitals and nursing homes. 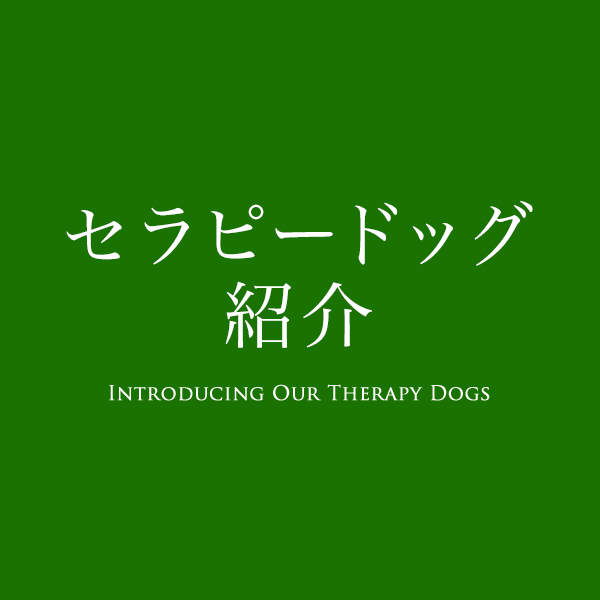 They study the therapy dog training curriculum, work on improving their dog handling techniques and human nature. 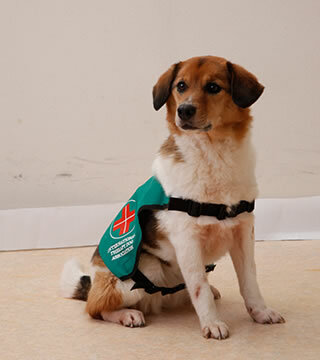 They also play an important role as bridge for communication between the patients and the therapy dogs. Chirori was a mixed female with disability in her hind leg, abandoned at a garbage dump together with 5 puppies she had just given birth to. 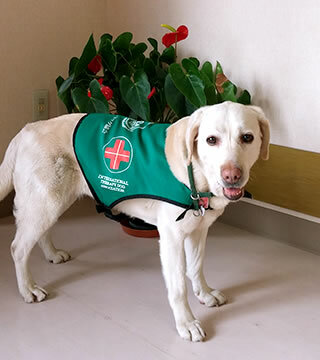 After being rescued just before being put down, she completed the therapy dog training curriculum, which normally takes 2 1/2 years to complete, in just six months to become the first certified therapy dog in Japan. 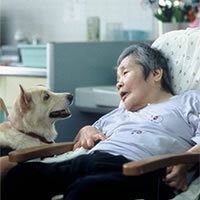 She achieved numerous miraculous results with the patients and laid the foundation for Animal Assisted Therapy (AAT) in Japan. Later, as recognition for her achievements, she received over 30 citations and letters of appreciation from the government. 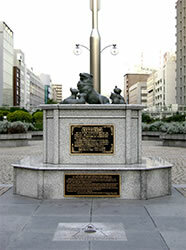 In May 2007, a bronze statue was erected at Tskijigawa Ginza Park to honor Chirori. Books on Chirori (by Toru Oki) have been designated as Recommended Books for Children and books to be read for book reports. 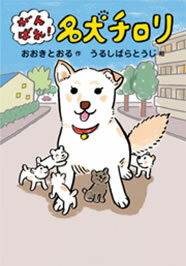 These books are read and loved by children all over Japan. Timex and Mic came to Japan from New York in 2002. Together with Chirori, they actively visited nursing homes, hospitals, schools and other facilities and were loved wherever they went. Approximate age at the time was 1 1/2 years old. At a park in the former Heiwadai Baseball Stadium in Fukuoka Prefecture. 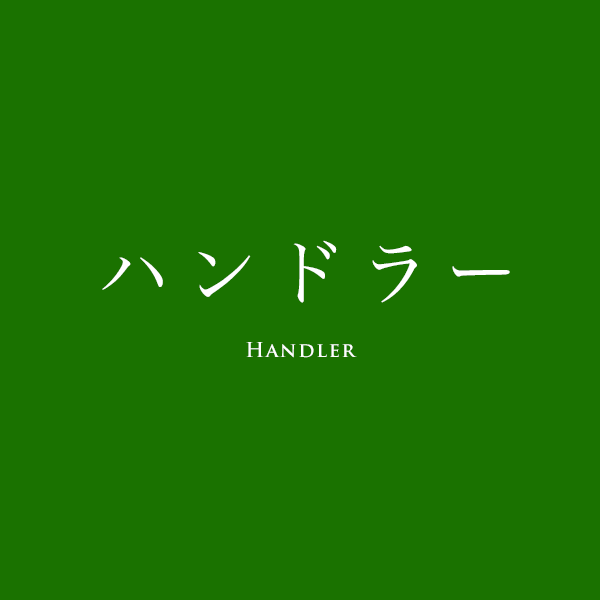 has been in a movie, and played the main role throughout without needing a standin. About 6 months old at the time of rescue. and kind like Peace. The two are like brothers and are always together on AAT visits. 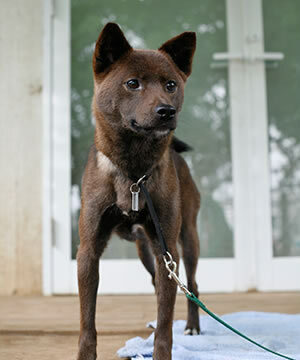 Animal Welfare Center in Chiba Prefecture, just before he was to be put down. the leash while walking alongside the patient. Approximate age at the time was 2 – 3 years old. Approximate age at the time was 6 months old. Animal Welfare Center in Chiba Prefecture, just before she was to be put down. therapy dog. She is full of energy. Approximate age at the time 2 – 3 years old. 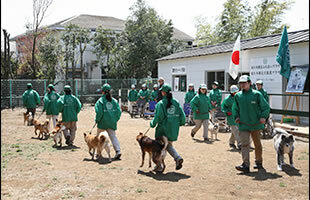 Ehime Animal Welfare Center. He was rescued just before he was to be put down. Dog pound in Fukushima Prefecture. She was rescued just before she was to be put down. 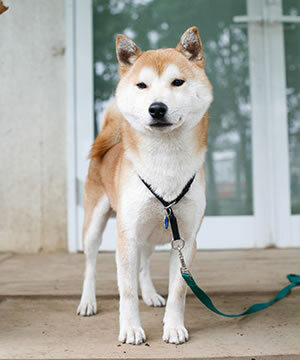 It seems her owner and the family were lost during the earthquake and tsunami. At the time, she didn’t seem afraid but without any expression and seemed to have no trust towards humans. But now, she will show you her underside herself and seems happy when you scratch her tummy. When we were visiting temporary housings in Fukushima, she seems to have felt a sense of fondness for the Fukushima dialect she heard there. Elderly people were quite happy when she would cuddle up to them with her face close to theirs. 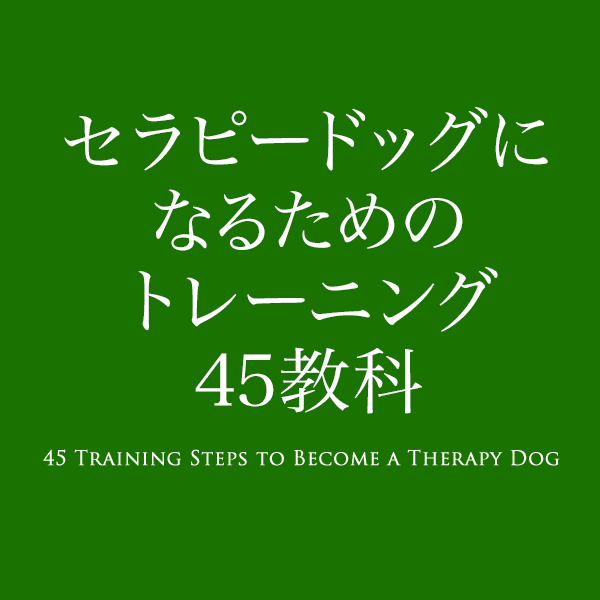 Hinomaru has completed the 45 step therapy dog training curriculum. December 2011. Approximate age at the time was 2 – 3 years old. 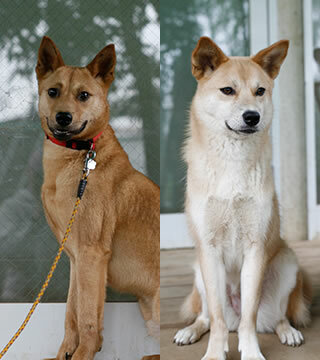 She was ear marked to be put down because staff at the Fukushima dog pound thought nobody would take her in because of the dark colored hair. Today, everyone loves her, saying what a wonderful coat of hair she has. She is a bit shy but a very gentle girl. 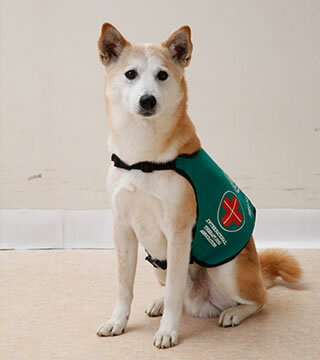 Kizuna has completed the 45 step therapy dog training curriculum. Approximate age at the time was 8 months old. They were rescued just before they were to be put down. Their mother escaped to the mountains after the earthquake and tsunami, and while wandering there gave birth to 4 puppies. 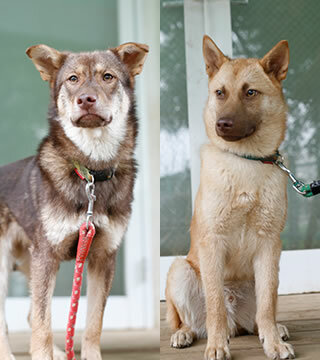 The family spent 4 months in the mountains as feral before local authorities captured 2 (Fuku, Sachi) of the puppies. For the next 4 months, they were put in a small cage and kept at the dog pound. Their bones became deformed, and they suffered from malnutrition. They were ear marked to be put down as they were considered feral. 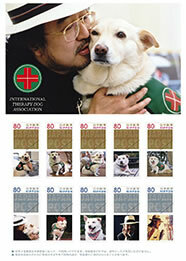 Toru Oki was the first human to hold them in his arms when he rescued them from their fate. 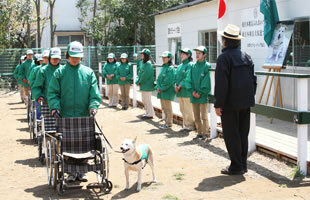 Fuku and Sachi have now regained their health, trained as therapy dogs, and are visiting the nursing homes. 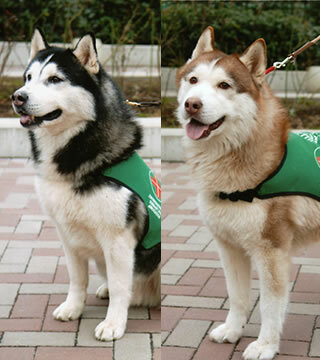 After the earthquake and tsunami, Kinji and Ginji were captured in the mountains by the local authorities. In the beginning, the two were suspicious toward humans. Now, they have started their visits to nursing homes. Approximate age at the time was 8 – 10 years old. He was rescued just before he was to be put down. 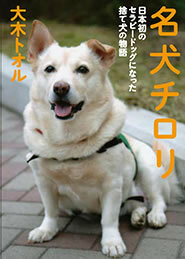 In spite of blindness, he was captured when he was wandering around Fukushima Prefecture. Because of his blindness, he was to be put down. 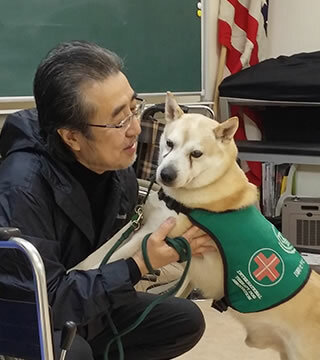 Currently, Toru Oki is personally training Kouki based on a therapy dog special training curriculum. 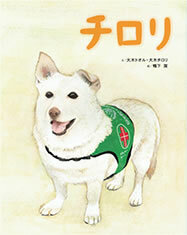 Kouki is a cheerful and smart dog.